The Soyuz TMA-16M spacecraft launches, carrying the 1-year mission crew to the International Space Station, March 27, 2015 in Baikonor, Kazakhstan. An American astronaut and Russian cosmonaut launched into space Friday to attempt something their two countries have never done together before: a one-year mission on the International Space Station that could help one day send humans to Mars. 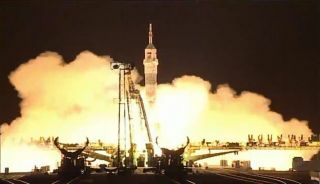 The epic one-year space mission launched NASA's Scott Kelly and cosmonaut Mikhail Kornienko into orbit aboard a Russian Soyuz space capsule at 3:42 p.m. EDT (1942 GMT) today (March 27) from the Baikonur Cosmodrome in Kazakhstan, where it was early Saturday morning local time. Also flying on the Soyuz is cosmonaut Gennady Padalka, a crewmember who will live and work aboard the orbiting outpost for about six months, the usual length of time people spend on the station. It should take Padalka, Kelly and Kornienko about 6 hours to reach the space station. If all goes according to plan, the three crewmembers will link up with the space laboratory at around 9:36 p.m. EDT (0136 March 28 GMT), and you can watch the docking live on Space.com via NASA TV starting at 8:45 p.m. EDT (0045 March 28 GMT). The hatches between the two spacecraft are scheduled to open at 11:15 p.m. EDT (0315 March 28 GMT), allowing the three space fliers to enter the station. The hatch opening will also air live on Space.com at that time. Scientists will use health and other data collected from Kelly and Kornienko during their yearlong mission to learn more about how long-duration spaceflight affects the human body. While researchers know a lot about what happens to people who live in space for six months, they don't know how the body changes with a longer stay in microgravity. A crewed Mars mission — a huge goal for NASA in the future — could take 500 days or more, according to the space agency. Therefore, learning more about the potential problems astronauts could experience during a long mission is important for NASA officials. Kelly's identical twin brother (and former NASA astronaut) Mark Kelly will participate in experiments on the ground to help scientists monitoring his brother in space. The Kelly twins will be monitored before, during and after Scott's spaceflight for a number of experiments chosen by NASA officials. "Today, we launch an American astronaut and a Russian cosmonaut to live and work in space for an entire year — the longest continuous stretch an American astronaut will have been in space," NASA administrator Charles Bolden wrote in a Space.com-exclusive op-ed. "It's an important stepping-stone on our journey to Mars, and will give us detailed medical data recorded throughout the one-year expedition." Kornienko and Kelly have been training for this yearlong mission for about two years, but this won't be the first time the astronauts have flown to space. Before this mission, Kelly logged 180 days in orbit during two space shuttle flights and one previous space station mission. By the end of this mission (scheduled to last about 342 days, just shy of a year), Kelly will have logged 522 days in space, according to NASA. Kornienko was selected as a cosmonaut in 1998 and flew to the International Space Station once before, for a 176-day mission in 2010. The near-yearlong mission will put Kornienko's total time in space at 518 days. "I believe that the main objective of our mission is to lay some foundation for future deep-space exploration — solar system destinations like Mars, [the] moon," Kornienko said during the news conference. Padalka will break a record with his six months in orbit. The veteran cosmonaut will become the record holder for most cumulative time spent in space for any human, according to NASA. By the end of his mission, Padalka will have a little under 900 days worth of spaceflight experience to his name. NASA astronaut Scott Kelly (left) will spend a year in space onboard the International Space Station. His identical twin brother Mark Kelly (right) will help scientists with experiments on the ground to give them a wide amount of data during Scott's mission. While Kelly's mission will mark the longest span of time an American has spent in orbit, he and Kornienko's mission won't be the first time humans have launched on a yearlong mission. Soviet-era cosmonauts spent a year or more on the space station Mir in the late 1980s and 1990s. "This is not Russia's first venture into having people stay in space a year or longer," Kelly said. "But the big difference with this flight is that it is the first time we're doing it with an international partnership, which I think is one of the greatest success stories of the International Space Station." Kelly, Kornienko and Padalka will join fellow crewmembers NASA's Terry Virts, European Space Agency astronaut Samantha Cristoforetti, and Russia's Anton Shkaplerov once they make it to the space station later today. At the moment, NASA relies on Russia's Soyuz spacecraft to take astronauts to the space station, but that could change in the near future. NASA is hoping to start ferrying astronauts to and from the outpost by buying seats aboard private spacecraft built by the American companies Boeing and SpaceX. Those missions could launch as early as 2017.